We had the merriest Christmas ever this year. (In spite of my cold.) The children were delighted with their gifts, and it was a very mellow day. We made the (difficult) choice this year to stay home and have a "just the four of us" Christmas. I am so glad we did. The children loved their dolls. Elisabeth has named them Claire and Peter, which I just love. I love that she chose such classic, old-fashioned names for them, and that clair means "light" in French -- so appropriate for a doll "born" at this time of year. In my last, delirious post, I omitted much of the doll odyssey, and have been getting comments and emails with questions about them. So, I'll try to give a shortened version of the whole adventure. 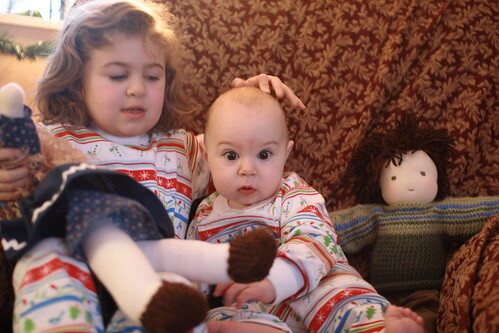 I've wanted to get Waldorf dolls for my children for a long time. I made a Baba doll from a Magic Cabin kit for Elisabeth's first birthday, so I knew the basics of sculpting the head and so forth, but had never really pursued making or buying them. This summer, I was dreaming about these and these, and I finally decided to jump in and make my own. First, I ordered the 12" doll kit from Magic Cabin. Once I had the body stuffed and pinned together, though, I realized that I really didn't like the 12" size and decided to make 16" dolls instead. So I bought a copy of Making Waldorf Dolls, some more supplies, and started afresh. This was in August. I had their heads made and their bodies stuffed by October (having to do this all in secret, while in the midst of my depression diagnosis, slowed things down somewhat). Then came the hair. Oh my. The Hair. Claire's hair was not too terribly difficult. It took about 3 (post bedtime) work sessions. And then she was done, albeit naked. But then came Peter's hair. I am not exaggerating when I say that rug-stitching his hair, loop by loop, using pliers to pull the needle through, took more than 24 hours total -- maybe closer to 30. By the week before Christmas, I was really afraid I wouldn't finish on time. But my sweet husband stepped in and spent a lot of time with Elisabeth -- playing with her in the snow, taking her along on errands, etc., so that I could work during the day. (Thankfully, his semester had ended, so he was able to help a lot.) I finished Peter's hair on the 23rd and then made their clothes that day (except for Peter's sweater, which I had knitted several weeks before). It was down to the wire on this project. But I got it done! And Elisabeth is terrribly delighted with Claire. James has shown some interest in Peter, but he's very little for this type of doll yet. (I know that a simple knot doll would have been the more age appropriate choice for his age, but you know how it is with siblings. Sometimes appearances must be kept up for the older sibling if for no other reason.) I'm just so proud of myself for completing something with my own hands that my children will have to play with for (hopefully!) a long time to come.